Sequoia has discovered two distinct classes of plant compounds that inhibit the swarming biofilms of gram-negative bacteria. We have prepared hundreds of analogues via synthesis, resulting in optimized lead candidates for further development. These optimized lead compounds inhibit type IV pili and are synergistic with certain antibiotics against swarming biofilm populations of gram-negative bacteria. Figure 1: Demonstrating the ability of Sequoia's lead compound to inhibit biofilms. In Figure 1, Sequoia’s lead compound inhibits the swarming biofilm of a cystic fibrosis clinical isolate of Pseudomonas aeruginosa. The first agar plate in the top left of the figure is a control plate without Sequoia’s compound. The Pseudomonas biofilm swarms across the entire control plate. In order from left to right, the next agar plates contain Sequoia’s compound at 0.25, 0.5, 1, 2 and 4 µg/mL. These data demonstrate that Sequoia’s compound at achievable lung concentrations has the potential to dramatically inhibit the Pseudomonas biofilms in the lungs of cystic fibrosis patients. Figure 2: Sequoia's lead compound works synergistically with the antibiotic tobramycin to inhibit swarming biofilms. In Figure 2, the agar on the right half of each plate was prepared with or without Sequoia’s compound, and discs with or without tobramycin were placed on top. Finally, a cystic fibrosis clinical isolate of Pseudomonas aeruginosa was inoculated onto the left half of each plate. On the control plate without tobramycin or Sequoia’s compound (top left), the Pseudomonas biofilms swarm throughout the entire plate. The top right plate contains 0.125 µg/mL of Sequoia’s compound and no tobramycin on the discs. The bottom left plate contains no Sequoia compound, and 10 µg tobramycin on the discs. The bottom right plate contains 0.125 µg/mL of Sequoia’s compound, and 10 µg tobramycin on the discs. 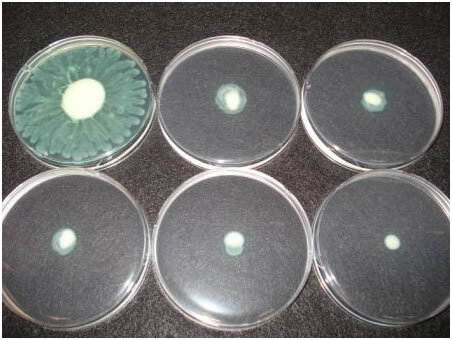 As observed in the bottom right agar plate, achievable lung concentrations of Sequoia’s lead compound work with tobramycin to dramatically inhibit the swarming biofilms of Pseudomonas aeruginosa. Figure 3: Sequoia’s lead compound works synergistically with the antibiotic colistin to inhibit swarming biofilms. In Figure 3, the agar on the right half of each plate was prepared with or without Sequoia’s compound, and discs with or without colistin were placed on top. Finally, a cystic fibrosis clinical isolate of Pseudomonas aeruginosa was inoculated onto the left half of each plate. On the control plate without colistin or Sequoia’s compound (top left), the Pseudomonas biofilms swarm throughout the entire plate. The top right plate contains 0.125 µg/mL of Sequoia’s compound and no colistin on the discs. The bottom left plate contains no Sequoia compound, and 10 µg colistin on the discs. The bottom right plate contains 0.125 µg/mL of Sequoia’s compound, and 10 µg colistin on the discs. As observed in the bottom right agar plate, achievable lung concentrations of Sequoia’s lead compound work with colistin to dramatically inhibit the swarming biofilms of Pseudomonas aeruginosa. Research suggests that bacterial infections including recurrent urinary tract infections, the lung infections of cystic fibrosis patients, sinus infections, ear infections, acne, chronic wounds, and periodontitis are caused by bacterial biofilms. Biofilms are communities of bacteria within matrices of biological materials that increase the bacteria’s resistance to immune responses, antibiotics, and disinfectants, while enabling their attachment to surfaces including human cells, medical devices, and teeth. While in biofilms, gram-negative bacteria display at least two types of motion: twitching and swarming. Swarming allows bacteria to move in large groups and to exist in harsh environments. Swarming is dependent on bacterial appendages called type IV pili, which mediate actual movement and contribute to virulence and biofilm formation and maintenance. Many different bacterial mutants with defective swarming abilities are also defective in biofilm formation, indicating that swarming mechanisms play key roles in biofilms. Swarming populations of bacteria have substantial alterations in metabolism that allow immediate adaptations to changing environments.